During the years our patients inquired about gift certificates for their loved ones. Finally they are here. 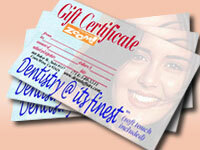 For your convenience we designed three types of Gift Certificates: one for the teeth whitening by ZOOM! , second for straiting of the teeth by Invisalign and a third one for General Dentistry. Our Gift Certificates are handy as presents for birthdays, weddings and during other holidays. You may purchase them at the office or over the phone. In a near future we plan to make them available for purchase over the internet. For now you can click on provided links to see an inlarged copies of Gift Certificates.